Home / How To / How to Rotate Screen on Windows 10? Windows allows you to rotate screen since the ancient times. This feature is extremely useful for those having a screen with a rotating stand. Portrait orientation is more convenient for reading, writing or any other sort of task which requires more phone-like screen aspect ratio. Screen rotation on Windows 10 is also an integral part of the laptops and tablets with touchscreens. It is nice to watch YouTube video in landscape but then continue reading the book in portrait mode. Laptops and tablets have automatic screen rotation on Windows 10. Monitors are yet to receive this feature which is why some users wonder how to manually rotate screen on Windows 10. Also, sometimes sensor misbehaves, and a user has to flip the screen manually. How to Rotate Screen on a Windows 10 Computer? Let’s begin as usual with simple things. Try to hold Ctrl + Alt + Arrow buttons (up, down, right, and left) together. Do note, though, that on some computers this combination does not work at all. If that is the case with your PC, simply move along to the next part of this article. Tip: Using Windows 8.1 or Windows 7? On these operating systems procedures are basically the same. Instead of Settings you should go to Control Panel and find a display settings section. Right-click on your desktop and select Display Settings. This quickly gets you to the needed section of the Settings up. You can also go there by pressing Win + I and opening System – Display. Choose whatever fits you better. If you have one screen connected to the PC, scroll down a bit and locate the Orientation drop-down menu. If you have several screens, select the one you want to rotate first, and then go to the Orientation list. Portrait options flip your screen to the right. Landscape (flipped) turns it upside down. And the Portrait (flipped) flips the screen to the left. Select Keep changes on the save prompt and you are good to go. 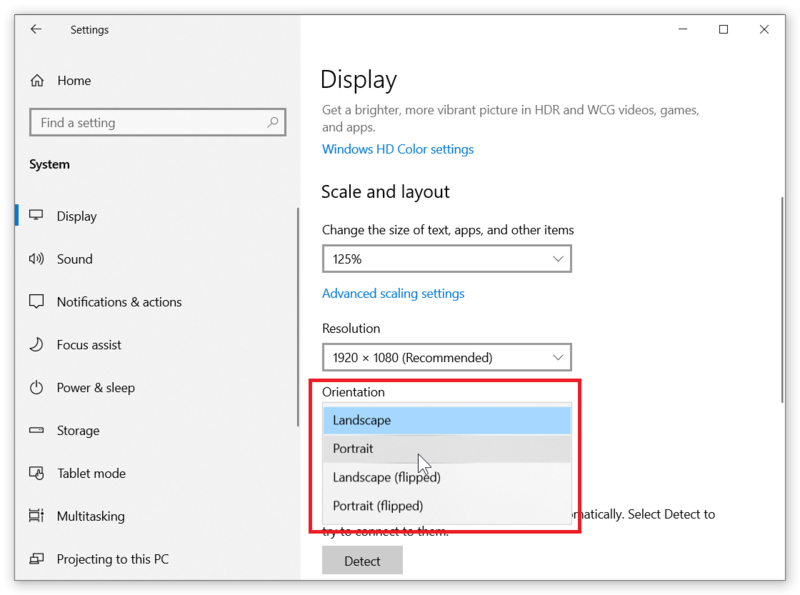 Next time you will want to rotate screen on Windows 10 back to normal simply do the same things but in the Orientation drop-down select Landscape. 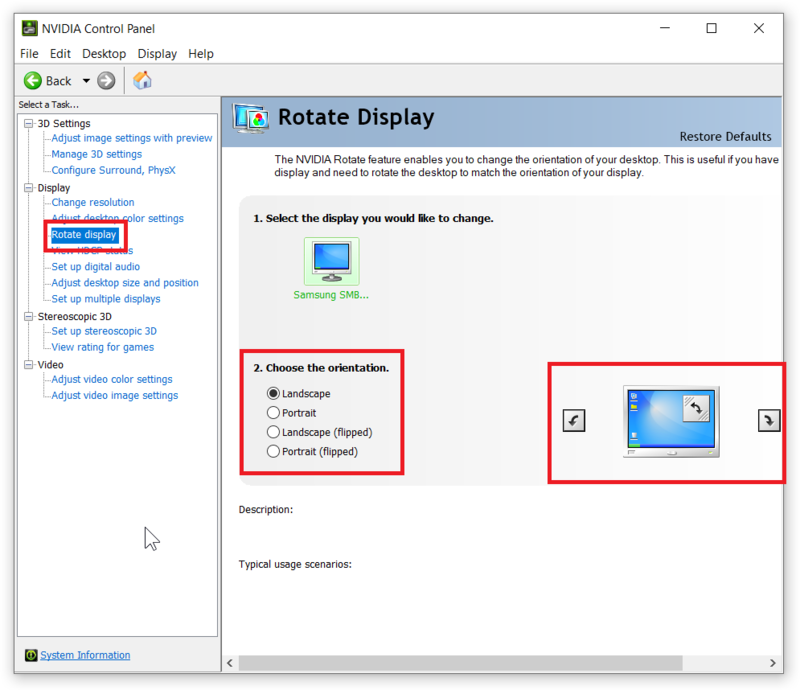 If you use Nvidia graphics card, there is another way to flip the screen on Windows 10. Again, right-click on the desktop and select Nvidia Control Panel. Needless to say, that you should have the latest drivers from Nvidia installed on your PC. At the left side of the window go to Display – Rotate display. Select the display you want to flip and then click one of the options below. Again, you have four options: Portrait, Portrait (flipped) and Landscape (flipped). Alternatively, you may use little arrow next to the screen picture at the right side of the window. This section is basically a clone of Windows Display Settings. AMD driver does not have this option because developers chose not to duplicate built-in Windows features. Windows Settings app does everything perfectly, so there is no need to waste time and energy coding an option to rotate screen on Windows 10 within the Radeon Settings app.